Chemically Inert, High Thermal Stability, High Resistance to Oxidation and Hydrolysis, Non-Flammable, Non-Toxic. 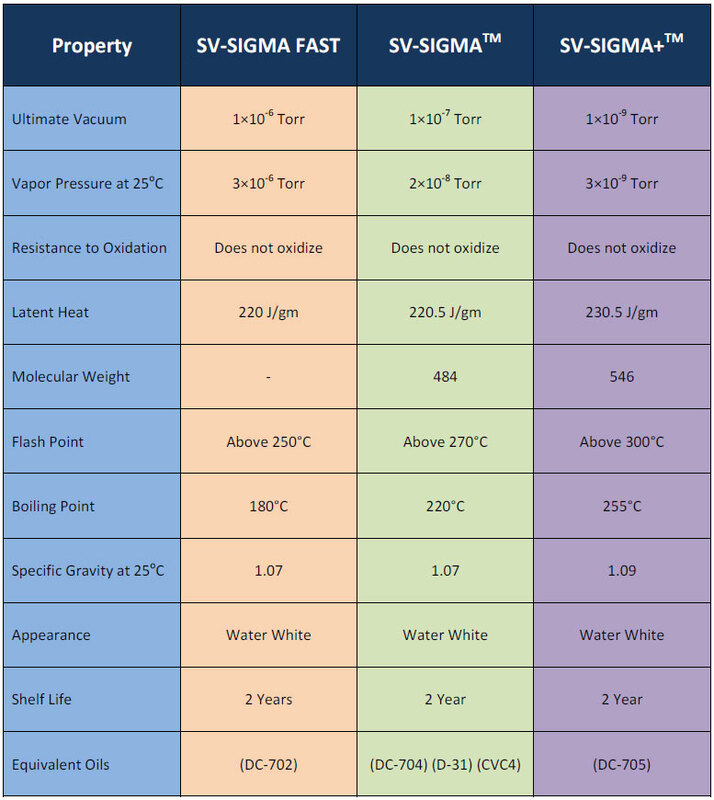 SV-SIGMA FAST- Fast Pumping of large volumes of gas/vapor in production process; SV-SIGMA- Produces ultimate vacuum of the order of 10-7 Torr; SV-SIGMA+ – Produces Ultra high and Ultra clean vacuum of the order of 10-9 Torr. 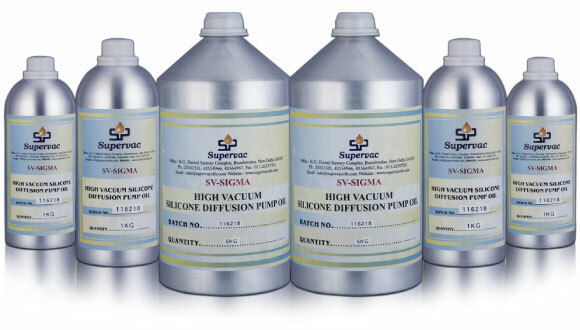 Supervac manufactures a complete range of Diffusion Pump Oils. These oils conform to international standards, passing through stringent tests and quality parameters. Therefore, they are compatible with all makes and models of diffusion pumps manufactured anywhere in the world. In other words, these oils are suitable for all Varian, Ulvac, HHV and any other Korean, Japanese, or Chinese diffusion pumps. SupervacTM SV-SIGMA FAST, SIGMA and SIGMA+ oils are manufactured specially for achieving high to ultra-high vacuum and for enabling rapid pumping or large volumes of gas/vapor during the production process. This is a Silicone Fluid manufactured specially for fast pumping of gas/vapor from the system. It can produce vacuum of the order of 10-6 Torr. It is an exact equivalent/replacement of the now-discontinued Dow Corning DC 702 Diffusion Pump Fluid. This is single component silicone oil designed especially for high vacuum of the order of 10-7 Torr. A premier product of Supervac, this oil exhibits excellent hardness when pumping out corrosive or moisture-laden gasses/vapors. SV-SIGMA is an exact equivalent/replacement of Dow Corning DC 704 fluid, Indomet Tetra, CVC4 oil, Hivac F4, Ulvoil D31. This is single component silicone oil designed specifically for ultra-high vacuum of the order of 10-9 Torr. 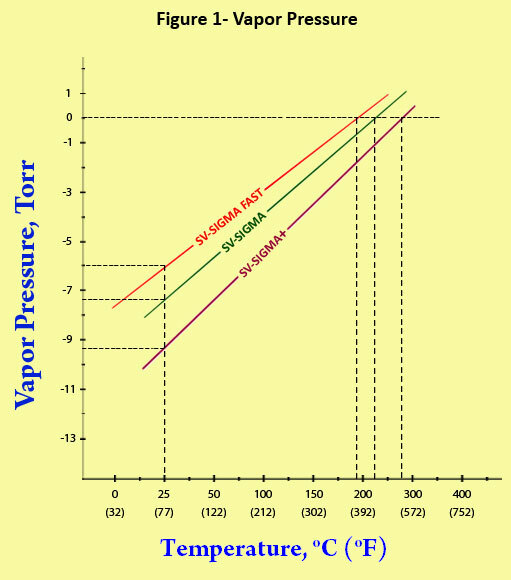 A premier product of Supervac Industries, SV-SIGMA+ has an extremely low vapor pressure, minimal back streaming rate and almost negligible creep. This is an exact equivalent/replacement of DC 705, Indomet Penta and Hivac F5. SV-SIGMA+ is most suited for ultrahigh vacuum applications. Supervac Diffusion Pump Fluids conform to international standards and are suitable for all types and makes of diffusion pumps around the world. Since the vapor pressure of the entire ‘Sigma’ range of Diffusion Pump Oils is very low, it creates little to no back streaming which can be a major headache for engineers. Since these oils are silicone fluids, they exhibit exceptional thermal and chemical stability. These oils are highly resistant to moisture. Thus, they offer a long working life without degenerating or cracking. Being Silicone Oils, SupervacTM range of diffusion pump oils is cleaner and easier on the system as opposed to mineral oils. Neither do they decompose easily, nor turn into black tar inside the pump. Also their low vapor pressure and low surface tension result in lower migration rate and low ‘creep’ phenomena inside the system. Users are saved from frequent opening and cleaning of the system, thereby saving time, money and effort. Supervac’s single component silicone diffusion pump oils reach their maximum efficiency in a short time as they have high latent heat. This ensures a low vacuum time and cuts down the cycle time considerably. Supervac Industries’ ‘Sigma’ diffusion pump oils are extremely hardy, resistant to oxidation and hydrolysis and built to last. They do not deteriorate when exposed to air at operating temperatures. Therefore, time is saved between cycles as the operators need not wait for the oil to cool down before releasing the vacuum. These oils, being chemically inert, do not react either to the metal interiors of the pump like steel, copper, aluminum etc. or to the process gasses or elastomers. 8. Non-Flammable and non-toxic, therefore totally safe to use. When stored in the original, sealed container, at or below 25oC (77oF), SupervacTM Diffusion Pump Oils have a shelf life of 2 years. 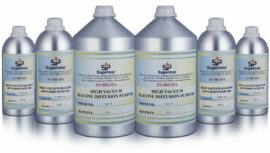 Supervac products are supplied to satisfied customers in 20 different countries all over the world.